While not a single Red Sox player graduated from prospect status during the 2016 season, the newly crowned American League Eastern Division champions had a distinctly homegrown feel. 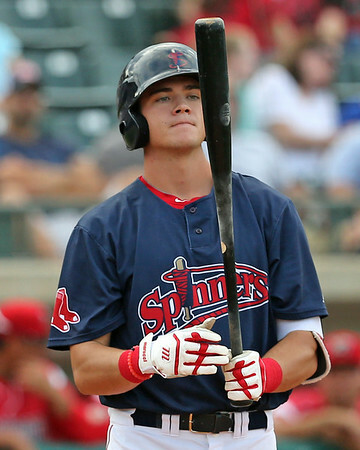 The team gave at least 50 at-bats to at eight players who had been named SoxProspects.com All-Stars during their ascent to the majors: Andrew Benintendi, Mookie Betts, Xander Bogaerts, Jackie Bradley Jr., Dustin Pedroia, Travis Shaw, Blake Swihart, and Christian Vazquez. With that backdrop, we present the 2016 SoxProspects.com All-Stars. 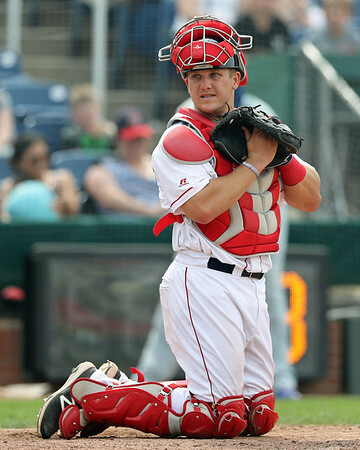 The 25-year old backstop turned in a solid season both offensively and defensively, earning honors as an Eastern League All-Star to go with his SoxProspects.com recognition. In 90 games with Double-A Portland, Romanski hit .308/.338/.410 with 22 doubles. While power is not a major part of his game, he did set a career high with four round trippers. He also solidified his reputation as a strong handler of pitchers and threw out 49 percent of attempted base stealers. It was the first all-star selection for the 2013 14th-round pick out of San Diego State. 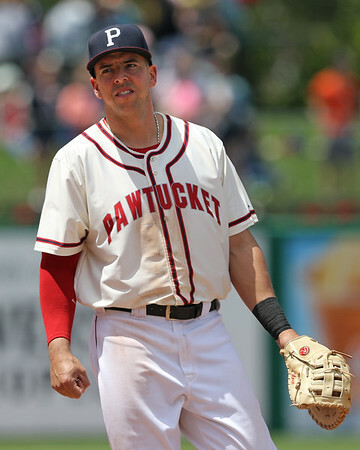 The minor league veteran was probably not the most likely Marrero cousin to get SoxProspects All-Star recognition, but Marrero’s monster campaign with the PawSox made him an easy choice. A first-round pick of the Washington Nationals back in 2006, the one-time top 30 prospect had arguably the best season of his minor league career. He earned a league All-Star nod for the fourth time in his professional career and celebrated by winning both the Triple-A All-Star game MVP honors and the Home Run Derby. In non-exhibition play, Marrero hit .284/.344/.494, placing second in the International League with 55 extra-base hits. The 27-year old is a minor league free agent this winter. Nothing better signifies the dominant individual performance the Red Sox had in their system more than the fact that Moncada was named the top player in all of the minor leagues in 2016 by Baseball America but did not earn SoxProspects.com Player of the Year recognition. A difficult introduction to the major leagues doesn’t dampen the incredible season of a player who looks to enter 2017 as baseball’s top prospect. Beginning the year with Salem, Moncada cruised to a .307/.427/.496 line with 34 stolen bases before getting the call to Double-A in late June. He barely skipped a beat, making up for the loss in a few points of batting average with even more impressive slugging numbers, battering Eastern League pitchers to the tune of .277/.379/.531. 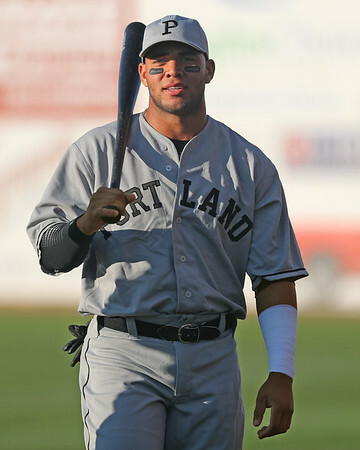 Across the minor league season, Moncada totaled 31 doubles, six triples, 15 home runs, 45 steals, and 94 runs scored. At the outset of 2016, all eyes in Salem were on Moncada, Benintendi, and Devers, but their lineup featured a fourth player in the system’s top 20. Dubon had a season every bit as effective as his more ballyhooed teammates on his way to getting recognized as the system’s Breakout Player of the Year. The 2013 26th-round pick showed an impressive batting eye and contact skill with Salem, hitting .306/387/.379 in the difficult environs of the Carolina League. After a late-June promotion to Double-A, Dubon added power to his game, delivering a .339.371.538 line and 32 extra-base hits in 270 plate appearances. He led the organization with 157 hits and 101 runs scored, becoming the first Red Sox minor leaguer to register both 150 hits and 100 runs since Lew Ford did so as a member of the Low A Augusta GreenJackets back in 2000. The only member of the 2016 draft class to earn All-Star honors, Dalbec needed only 143 plate appearances and 34 games to establish himself as one of the elite performers of the minor league season. The fourth-round pick out of the University of Arizona was impressive in the College World Series – as a pitcher. He earned the start in the deciding game three, taking the loss despite striking out eight and not allowing an earned run in 5 2/3 innings as the Wildcats fell to Coastal Carolina. His postseason stat line at the plate was more mixed and showed a potential issue with strikeouts, but Dalbec’s plus raw power and preference for hitting led the Red Sox to take him as a third baseman. That decision paid off in Dalbec’s pro debut, as he abused New York-Penn League pitchers with a .386/.427/.674 with 13 doubles and seven home runs. The seventh overall pick of the 2015 draft got off to a hot start as a professional, posting video game-type numbers on his way to winning SoxProspects.com Offensive Player of the Year. Benintendi followed that with a first full season that has arguably been even more impressive on his way to winning top Offensive Player honors again. Placed in Salem to begin the season, the Carolina League simply did not provide a ton of resistance. 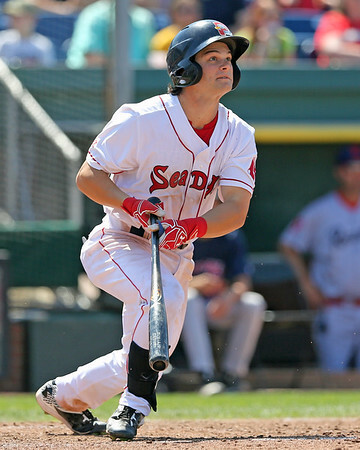 Benintendi’s ripped off a .341/.413/.563 line with 15 walks and only nine strikeouts before getting promoted to Double-A on May 16. Portland gave Benintendi a bit more trouble at first, as he went 16 for his first 78. That proved to be little more than a blip, as he hit .340/.408/.629 in his last 43 games, earning him a promotion directly to the major leagues. Benintendi’s outstanding play has continued in the major leagues, hitting .322/.386/.522 through his first 29 games, cementing his spot on the playoff roster and making him an early favorite for the 2017 Rookie of the Year award. 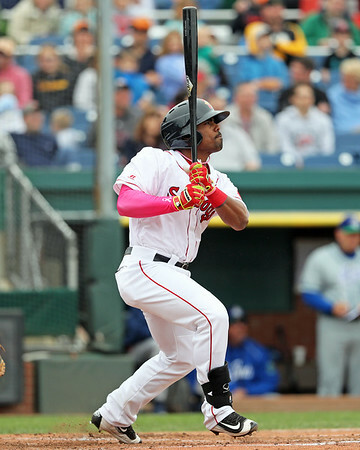 In his sixth year in the Red Sox system, Tavarez turned in by far his best campaign, earning recognition as an Eastern League All-Star and the Portland Sea Dogs team MVP. The 24-year-old from the Dominican Republic had never previously topped either a .300 batting average or .450 slugging percentage but exploded for a .335/.379/.506 line in 106 games for the Sea Dogs. Tavarez led the organization with 13 triples and added 20 stolen bases including two in a short stint at Triple-A Pawtucket. He closed the season on a 12-game hitting streak that saw him go 20 for 53 with 11 runs scored. A 19th-round pick in the 2014 draft, Hill took a huge step forward in his second full season. Despite a solid physical build, Hill showed little power in his 2015 debut, with only five extra-base hits – all doubles – in 43 games between Lowell and the Gull Coast League. It took only nine games for him to match that total in 2016, kicking off a season where he would rank as the Stedler Division Champions most consistent performer. Hill hit .332/.400/.487 while leading the squad in hits, runs, doubles, triples, and runs batted in. He was the first member of the Spinners to post a .400 on-base percentage in over 200 at-bats since Ryan Westmoreland back in 2009. 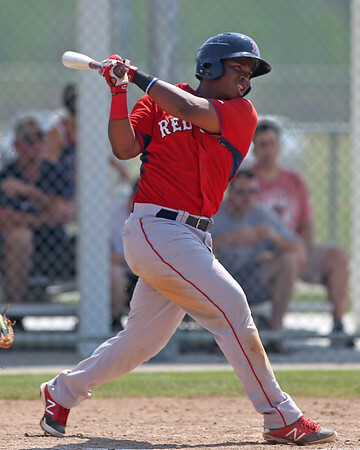 What’s wrong with Rafael Devers? The question was asked often in the early part of 2016, as the 19-year-old phenom got off to a .180/.268/.293 start through 40 games for High-A Salem. After entering the year as the system’s second-ranked prospect, a third straight recognition as a SoxProspects.com All-Star seemed in doubt. 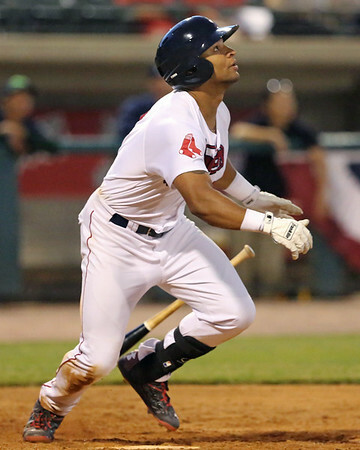 An eight-game hitting streak beginning May 28, and a five-hit game on June 9 gave an indication that Devers was adjusting to Carolina League pitching, and he cast aside all doubt in the second half. He was dominant in July, hitting .357/.408/.670, followed by a solid .328/.357/.487 August line. Devers also showed improved patience in his approach, taking 40 free passes, up from 24 in 2015. Kopech was not seen as a likely All-Star selection in the beginning of the season, but that was mostly due to off-field issues. After a suspension ended his 2015 season early, Kopech broke his hand in an altercation with a teammate that delayed the start of his 2016 season. Once he debuted near the end of June he was unhittable, lighting up radar guns while triple-digit heat and a potentially plus slider. The former first-round pick pitched to a 2.25 ERA with Salem while holding batters to a .147 average. He struck out 82 batters in only 52 innings but also walked 29. The 20-year-old did have some rough starts where he struggled with his control, including his last start of the regular season where he walked five and allowed six runs while only recording one out. While he walked five batters twice in 12 starts with Salem, he had double-digit strikeouts four times, showing the dominance every organization wants out of their pitching prospects. 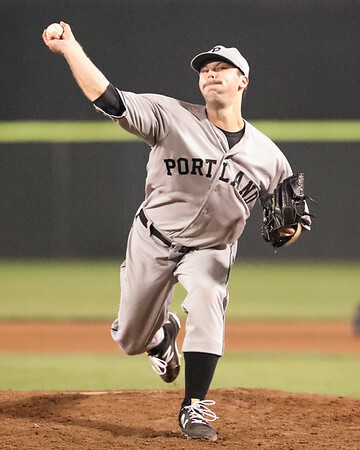 After going 5-16 with a 5.15 ERA over 124 innings with Portland last season, Haley looked like a different pitcher this season with the Sea Dogs, sporting a 2.20 ERA over 61 1/3 innings before being promoted to Pawtucket. His numbers took a bit of a step back with Pawtucket but he still had good success, going 8-6 with a 3.59 ERA over 85 1/3 innings. Between the two levels, he struck out 126 batters over 146 2/3 innings while walking 45. Haley works deeper into games than almost anyone else in the system, and he pitched eight innings in three of his 15 starts with the PawSox. 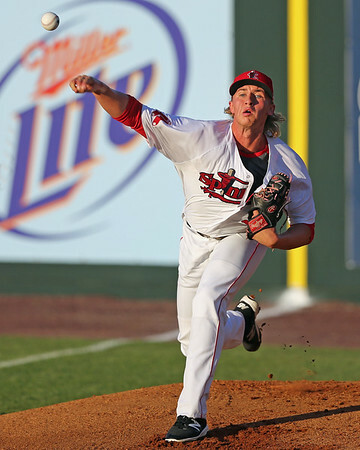 Starting the season as the second-youngest player in the South Atlantic League, Raudes showed impressive poise and command for an 18-year-old in his first full season assignment. With a fastball that sits in the high-80s and an average curveball and changeup, Raudes does not have tremendous stuff, but he was still able to notch 104 strikeouts over 113 1/3 innings. He has been a great surprise after signing for $250,000 out of Nicaragua in 2014, and his 3.65 ERA and 1.19 WHIP were the best for a Greenville starter this season. 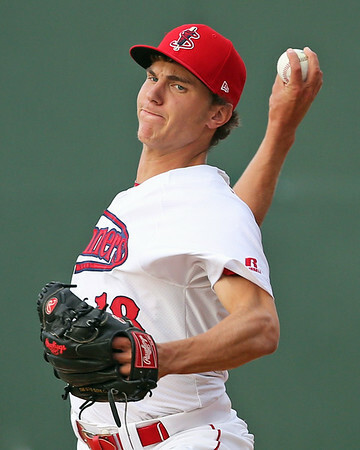 He walked 2.3 batters per nine innings and only hit one batter, a very impressive total for one of the system’s most unique prospects, and this is the second consecutive year that he has been named a SoxProspects.com All-Star. 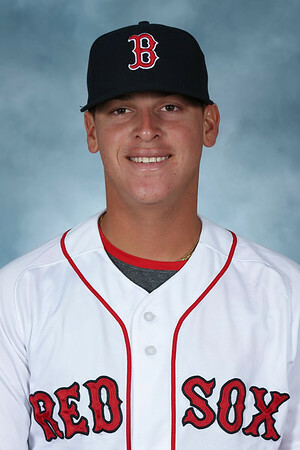 Diaz was named the SoxProspects.com Comeback Player of the Year after his return from a knee injury that sidelined him for the entire 2015 season. Over 60 innings in the Gulf Coast League, Diaz went 4-4 with a 2.85 ERA while walking 18 and striking out 57. Diaz’s ERA sat at 3.60 after his first 35 innings, but he finished off the season on fire, with an ERA of 1.80 over 25 innings. The left-hander from Venezuela just turned 20 and while there is limited scouting information available on him, he will be a player to keep an eye on in the 2017 season. The 2016 SoxProspects.com Pitcher of the Year, Cosart earned the honors due in large part to his absurd stretch from July 18 to August 31. Over that time he allowed one run on 12 hits over 23 innings, walking 12 and striking out 33. 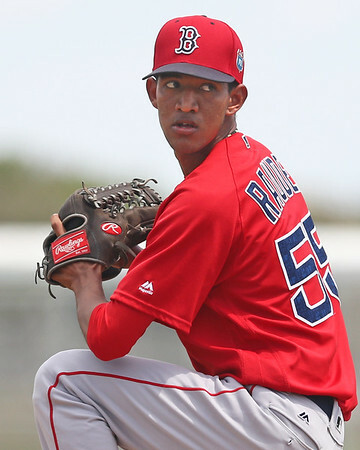 That was good for a microscopic 0.39 ERA and in the middle of that run he was promoted to Salem from Greenville. Cosart has a violent delivery that limits his ability to consistently throw strikes, but it also allows him to generate plus velocity and miss a lot of bats. In all Cosart pitched 70 2/3 innings of relief this season, striking out 104 while holding batters to a .172 batting average. Only Kopech had a better strikeout rate than Cosart over the course of the season. Scott’s strong 2016 season may end with him on Boston’s postseason roster. The 2016 Lou Gorman Award recipient made his major league debut on September 2, and he has not allowed a run over his first 4 2/3 innings. 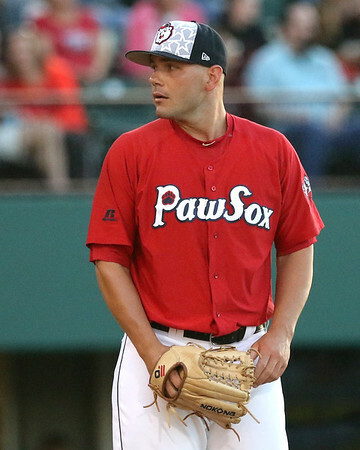 Scott started the season in Pawtucket where the left-handed reliever pitched to a 2.54 ERA over 78 innings. He was particularly tough on left-handed batters, as they hit only .147 against him with 31 strikeouts in 27 2/3 innings. 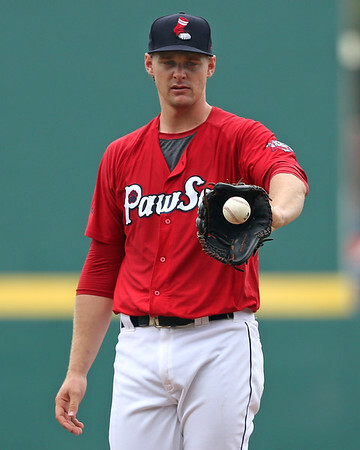 Signed out of Independent ball in 2011, Scott has performed at each level of the minors, and now he is contributing in Boston in the middle of a pennant race. While he may not be the pitching equivalent of Daniel Nava just yet, Scott has already offered a tremendous return on investment for the Red Sox. A seventh-round pick in 2015 from the University of South Alabama, Taylor enjoyed a strong 2016 season with Salem and Portland. After beginning the year in Salem’s rotation he was quickly shifted to the bullpen, where his performance took another step forward. With over 11 strikeouts per nine innings and a 1.08 WHIP, it is tough to find any holes in Taylor’s performance. He showed good control, an ability to miss bats, and was comfortable working multiple innings out of the bullpen. His best performance came on June 6 for Salem when he struck out 10 while allowing only two hits over four innings. He was promoted to Portland less than two weeks later, where he picked up five saves and kept the opposing team off the board in all but six of his 21 appearances. Story compiled by Jim Crowell and James Dunne. Jim is a Senior Staff Writer at SoxProspects.com, Follow him on Twitter @CrowellJim. James is also a Senior Staff Writer, @JamesMDunne on Twitter.